I'm here, house-sitting for a family member. Not only that, I'm dog sitting (two, big and cute) and cat-sitting (two, friendly), in the country, surrounded by fields and trees and cows and sheep! I'll have photos when I remember to get a computer, my camera and a connecting chord in the same place at the same time. I'm playing with naturally dying some lace-weight merino as I type, and have it bubbling away on the last stage, now. I'm deliriously happy as I take a break to check things on line. This IS the life. THIS is the life. This is the LIFE! Anyway you look it it, I'm in my element. 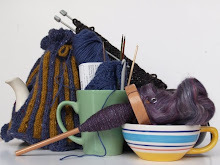 So, I'm curious, what's turned you into a yarny, happy person this week?